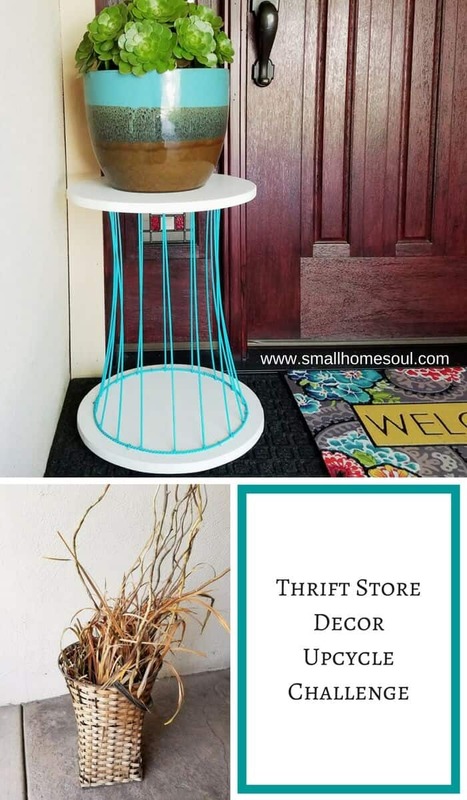 Outdoor Plant Stand - From an Old Basket - Girl, Just DIY! On the steps to their front door I saw this sad basket with scraggly dead stuff sticking out the top. It was destined to be an Outdoor Plant Stand, I just didn’t know it at the time. “You’ve just made me one happy husband!” How many times have you heard that from a stranger? 😁 This guy was was lurking in the shadows. I didn’t see him and he startled me. He’d been sitting quietly in his lawn chair in the middle of the garage, between outdated lamps hanging from the rafters and even more outdated and very large pictures. He was there with his little dog manning the garage sale. But why was I making him such a happy husband? A quick scan of the garage sale driveway and I could see they had all kinds of stuff and he was helping his wife get rid of it all. 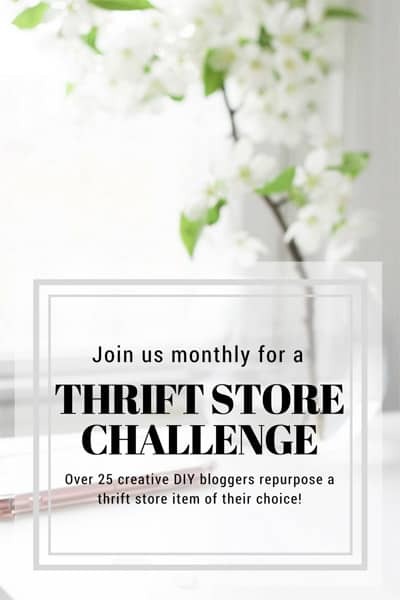 I wasn’t looking for anything particular but I’d started participating in a monthly Thrift Store Decor Upcycle Challenge so I was looking for stuff to makeover. 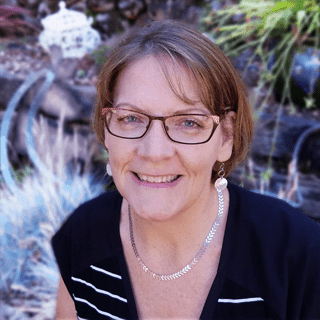 It’s a fun challenge and people get so creative so be sure to check out all my blogging friends’ projects at the bottom of this post. They always have such great stuff to inspire you! He got a good laugh and so did my husband when I told him the story. If he saw the original basket he might have thought I was crazy (er). 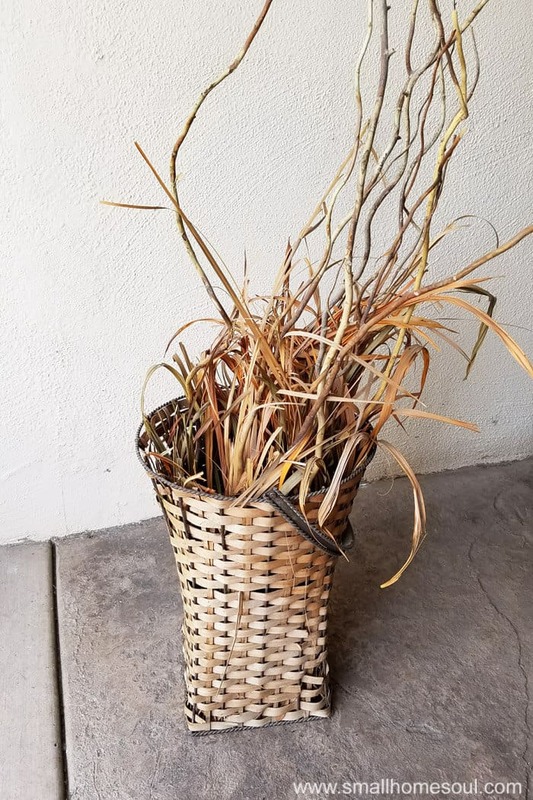 I rushed home and pulled out all the dead stuff and the reeds that made up the sides so it just looked like an empty basket when my hubby got home. He was still pretty unimpressed, but just wait…. Mulling it over for almost a week I still didn’t know what I wanted to do with it. Then it hit me, without the handle it might make a nice table for the patio. So I set out to make something awesome from something ugly. Start by removing the handles with a hacksaw or a rotary cutting tool. 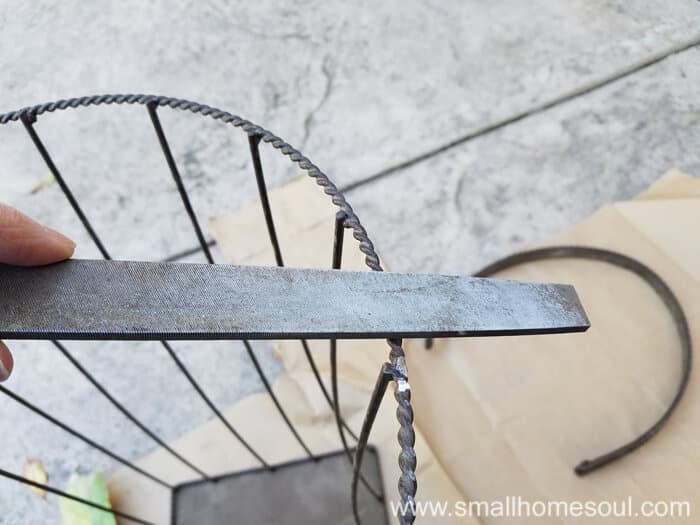 File away any sharp metal edges using a rasp. 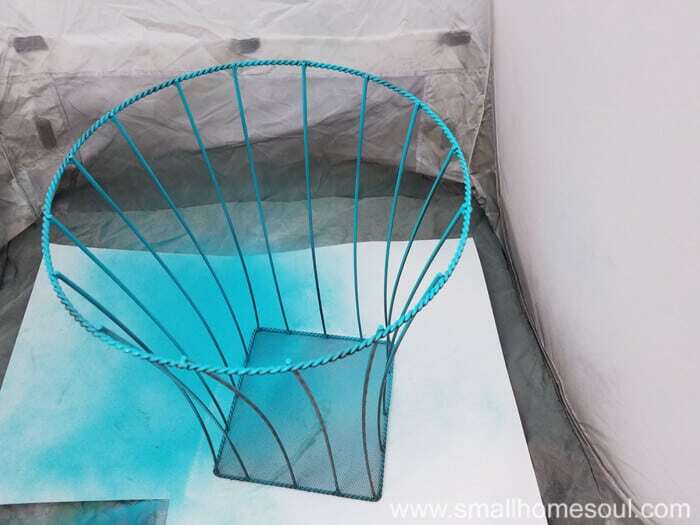 Set up your small Small Spray Shelter and give it a coat of paint in your favorite color. I love Seaside. 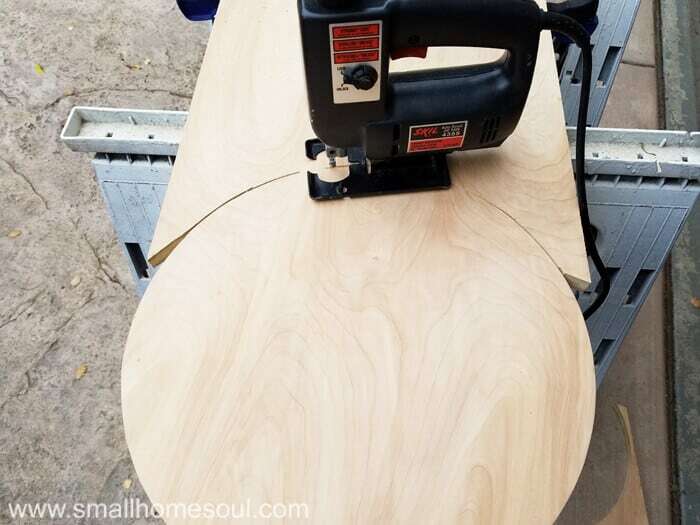 For this part you can either use two purchased 15″ pine rounds or cut your own. I opted to cut my own from two big pieces of 3/4″ clear plywood left over from our Murphy Bed project. Opened your saw horses and lay one board across both horses. Clamp the board you are cutting to the sawhorse so it doesn’t slip. Make your circle pattern. I traced around some pine rounds I’d bought for another project. Start cutting your circle using your Jigsaw. If you’ve used one before practice on a scrap board first. Starting from the end of the board and following the outline cut 1/3 around the right side then 1/3 around the left side. Finish by cutting the final 1/3 holding it steady with your hand. Repeat the process for circle number two. When top and bottom are cut give the edges a good sanding with using the palm sander starting with 60 Grit paper, then 120, and finally 220 for a smooth finish. To keep the bottom board from sitting on the ground add little feet. I started out trying to make them all perfectly even but they’ll rarely be seen so I got them close and I’m happy. 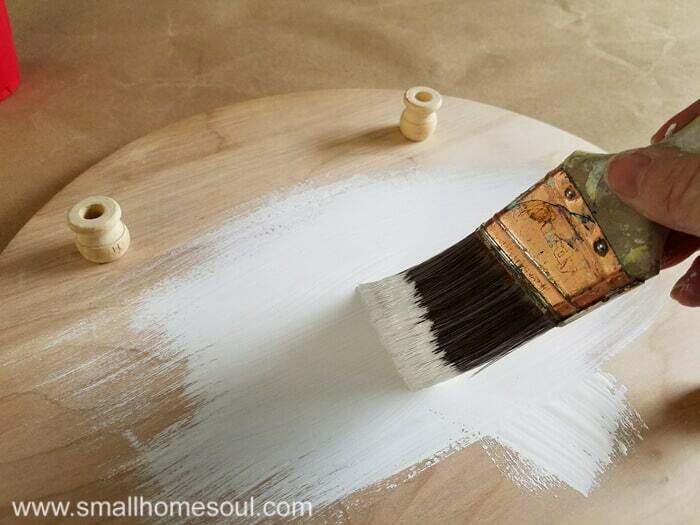 Give your base and top a few coats of white chalky paint and it’s time to assemble the Outdoor Plant Stand. I made my own with the recipe my friend Denise at My Thrifty House uses, 4 Tbsp Plaster of Paris, 2 Tbsp water and 2 Cups Paint. You can increase or decrease the ratios as needed. WARNING – Do not mix the Plaster of Paris and the water until you are ready to mix it into the paint. I had to run off to the hardware store (a quick trip) so I put a lid on my 1/2 pint mason jar. When I got home it was rock solid and I had to toss the jar in the trash. Since there were no holes for screws in the rims of the basket I had to figure out how to attach it to the board. That quick trip to the hardware store I just mentioned? I searched all over before I finally found poultry fencing staples. They’re galvanized so I needed to make them pretty. Lay out the fencing staples on cardboard and cover the bottom half with painters tape. Pick up the tape with the staples attached, turn it over and tape the other side. Paint side one, when dry flip it over and paint side two making sure the very top of the staple (that will show) is painted also. Attached the original bottom of the basket to the underside of the top board first. Using a ruler measure each side and make adjustments until it’s centered. Hammer in your first poultry staples then move to the opposite side and attach another. Follow this pattern until you have two staples on each side. My basket had a square bottom that I attached to the underside of the tabletop. 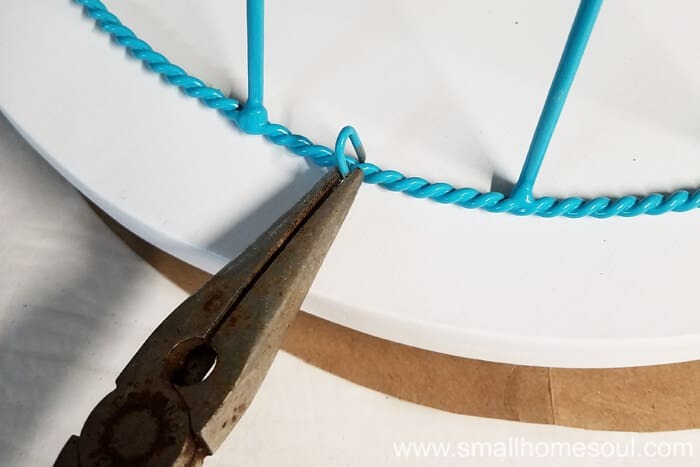 You might have a round basket so use at least six staples attaching a round wire basket to the wood top. 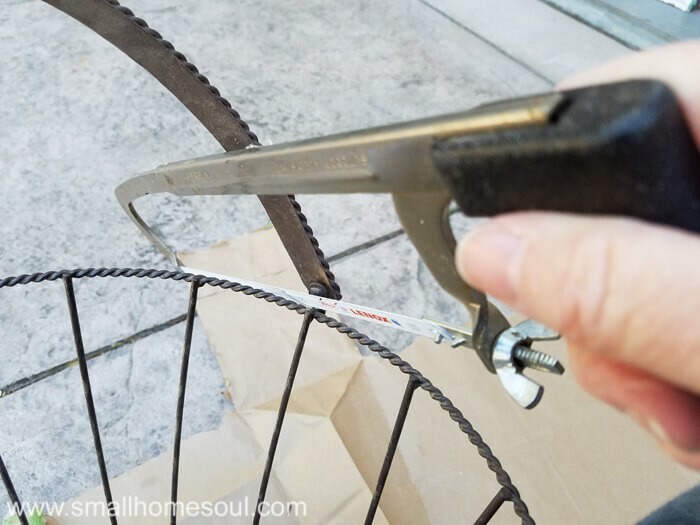 If you can’t get your hammer through the sides of the basket you might need to use a cordless drill and screw, a staple gun, or construction adhesive to attach the basket bottom to the wood top. Hold the staples in place with needle-nose pliers and hammer in the staples. If the staples are fatter at the bottom squeeze them together with the pliers so they fit more snugly around the wire. The Rustoleum paint held up fantastic even with all that hammering it took. If a few needed a little touch up spray some paint onto a paper plate and used a gloved finger to dab over any cracked spots. Originally I thought about using this as a side table on my patio. 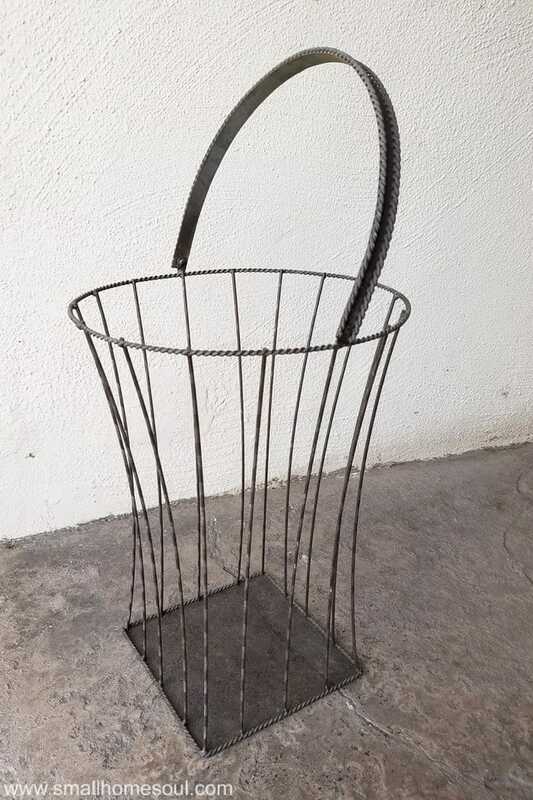 With this basket the varying angles of wires creates an optical illusion looking through it and made it appear to lean. 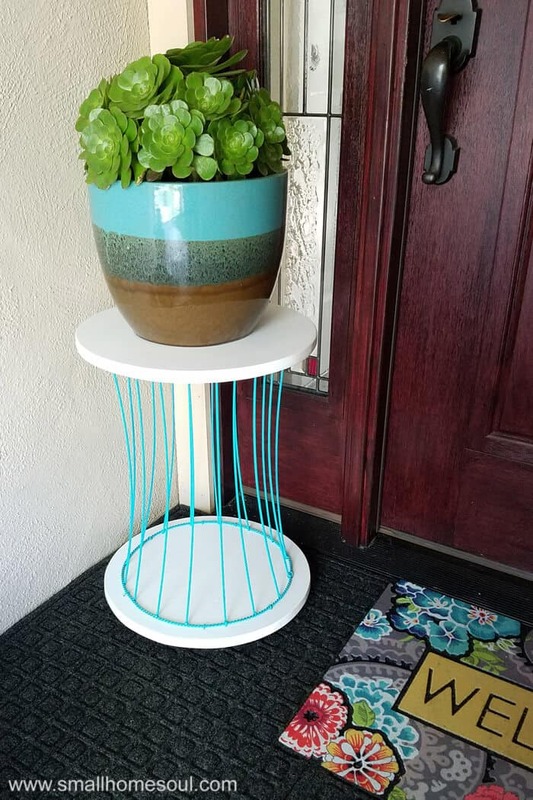 Figuring I had to find a place for this pretty table I carried it out front and it found its new home as an outdoor plant stand on my front porch. 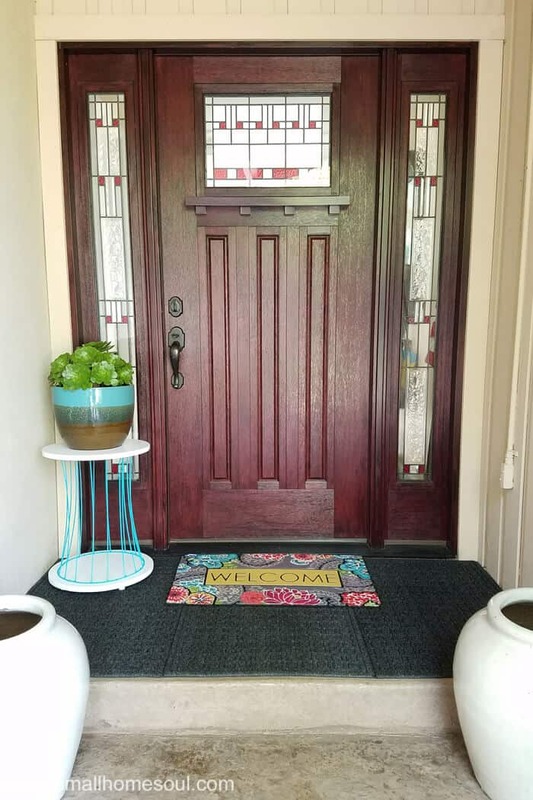 I was in the process of making over our front porch and just by chance the Glossy Seaside looks really great with the new door mat and flower pots. Hi Toni. Loved how you repurposed the basket. I look at just about everything in terms of a potential plant stand. What you did is another great idea I can tuck away for reference when I too run across that fun find. Love that you share and educate the rest of us. Thank you Tonya, I’m so happy that you liked my project. There are so many great repurpose ideas for stuff we can get cheaply at a garage sale or thrift store. This is a fantastic upcycle! It’s amazing what you did with that old, worn-out basket. You had such creative foresight. Nice job! That turned out beautiful! What a great idea. I love the color too! Great repurpose Toni! Love all the colour you chose! Looks right at home there on your porch. Thank you Sam, I love that color too! Wow! How cool! I would have never in a million years came up with the idea to turn that basket into such a beautiful piece of furniture! Great job! Thanks Amanda, it was fun to transform it and hard to believe what it used to be. That is a super CUTE update. 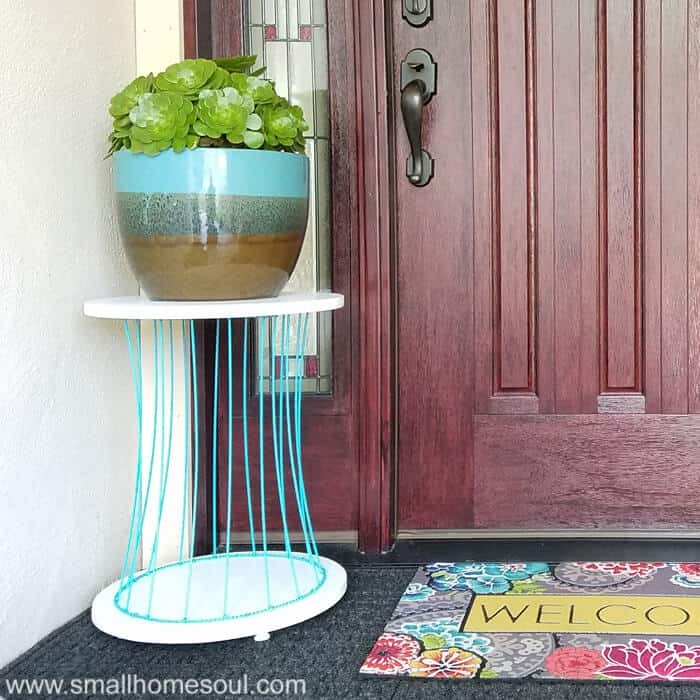 Perfect for a front porch! Aw thank you Ashley, I’m so happy that it inspired you. Great project! I will say that I saw that you can buy wood cut into circles at Lowes! So I could totally skip the scary saw part. I will definitely be on the lookout for a wire stand or basket! Love it! Yes Kim, and that’s what I will use the next time 😀 I had two I was using for another project and didn’t want to go buy more. Next time I’ll do just that because I could have driven there and back about 3 times in the time it took to make these. But it’s cool using the jigsaw from time to time. This is such a creative project! I would never have imagined that basket as a stand/table. Thanks Lora, I wasn’t sure I could pull it off but so happy it worked so well. I never would’ve thought to take a basket apart! It’s such an adorable pop of color! Thanks Kim, I couldn’t have done it without the hacksaw, and some extra muscle from the hubby. I can’t believe that nicely shaped wire frame was in that basket. You did an amazing job with this upcylce. 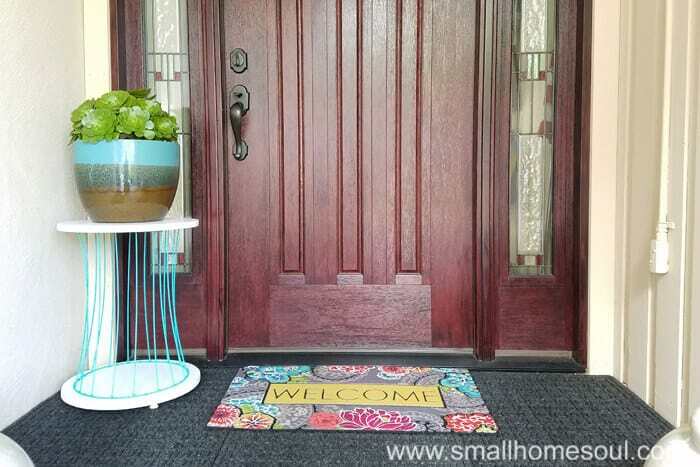 The color is perfect and adds a nice pop of color with the door mat! I love it! Michelle, It was the little basket that could. I didn’t even try to match the paint to the door mat but it was meant to be, wasn’t it? What a great project Toni! The beautiful blue color is so welcoming! Thank you Michelle, I’m loving the blue! Holy cow! Your project is amazing. All for $2 too. I can’t believe how great it turned out. 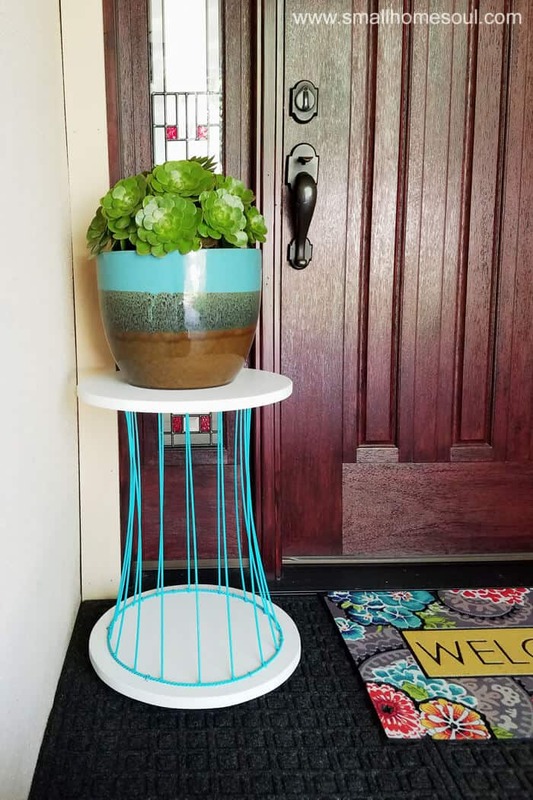 It looks like a high end stool/plant stand that I’d see at Home Goods for $60! Amazing upcycle. Thank you so much for sharing. This is so creative. You turned a ugly beast into a beauty. Hi Debra, thanks so much, it is a little beauty now. This is beyond clever! Talk about not judging a book by its’ cover. I never would have thought to utilize the metal frame from inside a basket. In fact it wouldn’t even have dawned on me that the metal frame was even usable! Very impressive indeed! Oh Maureen, that cover was ug-ly. Toni, this is so cool! Love the bright aqua with the white. I’m sure your hubby loved it! This is an amazing transformation. I love that you thought outside the box and created something entirely new with the basket. 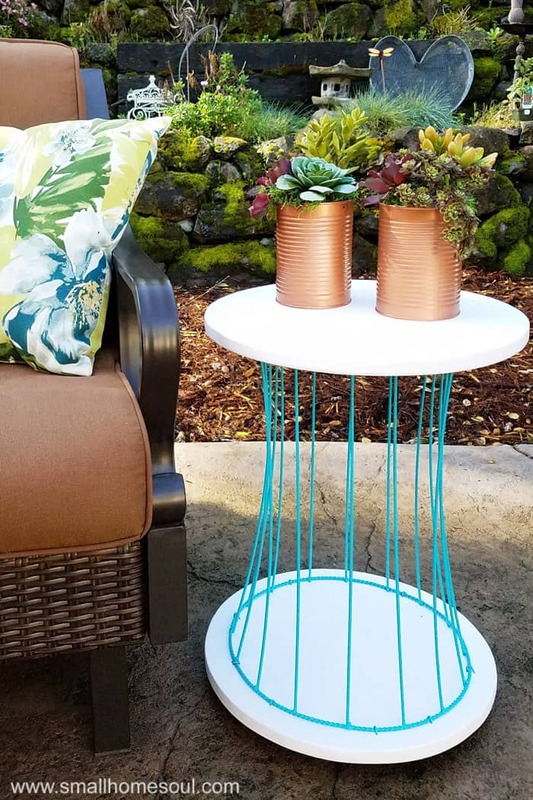 The plant stand/table is so versatile! Thank you Erlene, I still can’t believe what it used to look like. Haha, your intro made me laugh! I love what you did with this – and the colour is gorgeous! It’s nice to make some hubbies happy, even if they aren’t your own. But when we make ours happy, even better 🙂 Thanks, I love the color too! Great upcycle Toni! Looks great by the front door. Visiting from Thrift Store Upcycle.